Did your bank recently downgrade your rewards credit card earning rate? As of July 1 2017, a number of Australia’s financial institutions have slashed points earning rates for rewards credit cards. The action stems from the Reserve Bank of Australia’s cuts to credit card ‘interchange fees’. This has an impact on the profits that the banks can make from individual card transactions. These changes kicked in on July 1. The good news is that American Express Australia is exempt from the RBA’s new laws. With direct-issued American Express cards offering generous sign-on bonuses and other perks, now might just be the best time to consider ‘switching’ most of your spend over from the banks and getting a shiny new AMEX for your wallet. Here are some of the main reasons we love American Express. American Express is known for enticing new customers with very generous sign-on bonuses. You can currently pick up a 55,000 point sign on bonus with the Qantas Ultimate Card or 50,000 bonus points with the Explorer Card . And savvy travellers will love the Platinum Edge Card with a $200 travel credit and a low annual fee. Did your bank lower or cap your points earning rates? With Amex you’ll receive an uncapped earn rate! 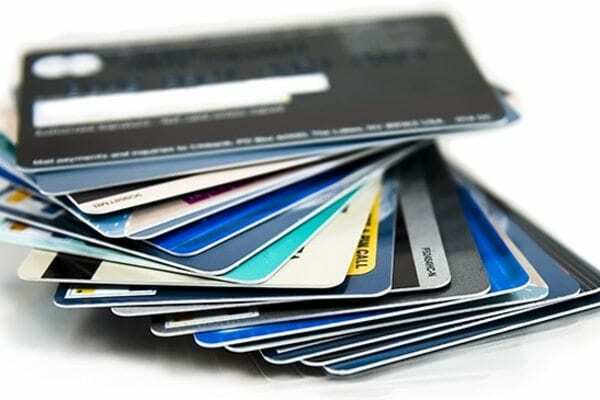 Several banks, including NAB, recently introduced a restrictive ‘cap’ on credit card points earning. This means that once you spend a certain amount per month, your ability to earn points is restricted. Boo! American Express imposes no points cap on their credit cards, which is great news for big spenders. No matter how much you spend per month or per year, you’re guaranteed to receive the full serve of points. In the past, American Express has had a reputation for not being accepted by many retailers. However, many businesses – both big and small – have signed on in recent years. And with a bit of forward planning, many people will find it easy to direct the bulk of their monthly spend onto AMEX. These days, lots of retail giants happily accept AMEX, including supermarkets such as Coles and Woolworths, as well as department stores retailers like David Jones and Myer, plus petrol stations and many small businesses. AMEX is even accepted by PayPal, which is often a payment option for utility, insurance and rates bills. While American Express offers direct Qantas and Virgin earn credit cards, they also offer a suite of cards that earn American Express Membership Rewards Points. Why are AMEX points so valuable? 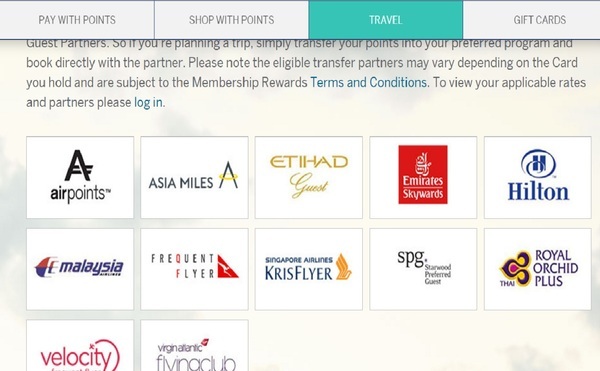 It’s all about flexibility – they can be transferred to a number of leading airline partners (Emirates, Virgin, Cathay Pacific, Singapore Airlines and more), can be redeemed for gift cards at Myer, David Jones and other retailers, and can even be used to pay off a credit card bill with the ‘Select + Pay with points’ scheme. And unlike some other programs, when you choose the Membership Rewards scheme, the points you earn on your Amex Card won’t expire, for as long as you are a customer and your account remains in good standing. Once you are an AMEX cardholder, you can access ‘Amex Offers’. The scheme saves cardholders’ money on some of the biggest and best brands. 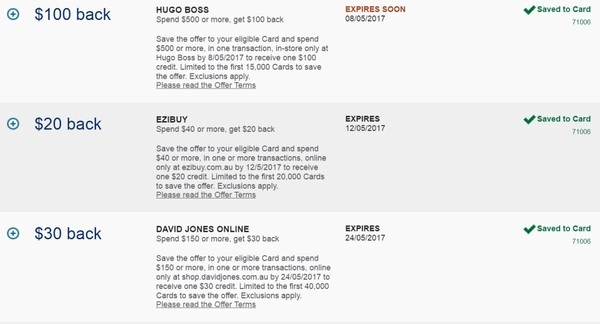 There’s a range of offers available – $30 off $150 spend at David Jones, or $20 off $60 spend at BP. These offers can come in very handy. You can access a current list of offers within your online account. The list of current offers available via my AMEX online account. Sure, it’s sad to see the banks slash earning rates on reward credit cards – but savvy Australian frequent flyers can still earn points quickly with direct-issued American Express cards. If you’re not already on the American Express bandwagon, now might be the time to join.